The intricacies and mysteries of Social Security can be daunting to a person of any age, particularly when it comes to correctly claiming benefits. After years of dutiful dedication and hard work, the last thing you want is to miss out on your share. 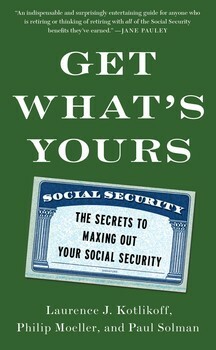 In the new book Get What’s Yours: The Secrets to Maxing Out Your Social Security (Simon and Schuster) authors Laurence J. Kotlikoff, Philip Moeller and Paul Solman explain how the system works and how to maximize benefits in terms anyone could understand, especially millennials. Their book came out Tuesday, and it’s already the top-seller in several categories on Amazon.com. Beginning with a basic overview on what Social Security is and why it’s important, the authors empower readers to make informed decisions that could result in more money for those crucial retirement years. They take the “2,728 core rules of Social Security” and condense them into easy-to-understand formulas. The authors break the book into chapters based on various life situations – married, divorced, widowed, gay, etc. – and give relevant advice to increase benefits and decrease stress. Direct quotes from the Social Security Agency and simple math formulas make it easier to understand the system, while question-and-answer sections help with the simplest and most complex problems you could run into while claiming benefits. Though sections can become dense with legal jargon and numbers, the three authors use their individual levels of expertise to explain complex concepts in as simplistic terms as possible. They stress to readers the importance of waiting to file and begin saving early. Co-author Moeller, journalist and founder of insure.com, offered us a number of tips for millennials and others. 1. What’s the biggest point regarding Social Security you and your co-authors wanted to get across in this book? I think the most important thing is for people to realize this is a really significant part of a successful retirement and the way Social Security can improve the quality of their later lives. You can claim Social Security as young as age 62 in most situations, that’s called early retirement. If you wait to claim until age 70, your monthly benefits are 76 percent higher than if you claim at age 62. Now not everyone can wait those extra eight years — some people need the money, some people have health issues — but given tremendous gain in longevity in recent years, people are living a lot longer. That additional monthly income can last for decades. It’s just important for people to realize how much is at stake and make sure they take the time to make the claiming decisions that are the best ones for them. 2. What can those of us who are a little farther from retirement do now to help us in the long run? I think there are two things that I would urge younger people to think about: the first thing is that Social Security is really a young person’s issue. Larry, Paul and I are all well into our sixties, our Social Security benefits are pretty much locked into place for us. They need to care about if social security is financially stable and that it’s going to be around for them because Social Security is the major source of income for older Americans. It’s an asset that needs to be in place for all generations. So that’s the first thing. The second thing is that — and I don’t mean to come across like a skull — but it’s never too early to start saving. A dollar that is put away in your twenties is worth anywhere from five to ten dollars that you save when you’re 40 or 50. By saving early, you get the advantage of the gains your dollars can have in 10, 20, 30, 40 years. That can make the difference between the retirement you would like and the retirement you would have to accept if you don’t take advantage of that. I guess my message is: you need to plan for a good retirement and you should start early. 3. Do you think it’s a valid concern to worry about Social Security running out by the time we’re that age? It is a valid concern. The last time Social Security was significantly altered was in 1983. The changes in 1983 created a really good outlook for the system going forward. But we’ve known almost since then that we would need to get in and fix the system, meaning restoring its long-term financial stability. Right now, by the year 2033 the current projections are that if we don’t do anything, Social Security’s trust funds will run out of dollars and the program will only be able to pay 77 cents for every benefit dollar it owes. So we need to make some improvements to make sure of that, and that’s only 18 years away. If you go further out, the projections get worse. Social Security needs to get looked at, Congress has known this for decades and hasn’t been able to do it. It doesn’t look like the current Congress will agree on much of anything with the Obama administration so it’s unlikely we’ll do anything significant with Social Security until after the 2016 elections. The program needs some attention and that’s what I would care about at your age. 4. What are your top three tips for increasing your Social Security benefits? The first is to get serious about delaying when you claim Social Security benefits. I think the second point is to make sure you take advantage of all the benefits you may be entitled to. Aside from retirement benefits, Social Security gives benefits to disabled people, benefits to spouses, benefits to divorcees or divorced spouses, benefits to survivors and, even in some cases, benefits to the children and even the parents of people who claim Social Security retirement benefits. People need to make sure they take full advantage of the benefits. The third is they need to make sure they claim their benefits at the right time. Depending on your age, and other variables, you can claim benefits that will bring you much more money depending on when you claim them, people need to be aware of that. And, of course, I would say if they read our book they will be aware of it.